Pannell Discussions » 19 – The greatest leap » Ideas in economics, environment, policy and more. I’m something of an Olympics tragic. The Athens Games provided plenty of the right sort of drug to feed my addiction: wonderful performances, surprises, disappointments, euphoria, and copious Australian success. There is something particularly special about world records, and as usual we saw a number of them at these Games. There are two clear patterns with world records. Firstly, when world records are set, they are almost always only very slightly better than the previous record. Secondly, in most events, world records are set fairly regularly, and the world mark follows a pattern of steady improvement over time, reflecting a general improvement in standards for all competitors. But there is one athletic event that completely violates these patterns, and one performance in that event that still seems amazing 36 years later. The event is long jump, and the performance is Bob Beamon’s winning leap at the Mexico City Olympics in 1968. This jump was so incredible and so much further than any previous jump that it is hard to convey the real magnitude of the achievement. To give an early hint, it would have been sufficient to easily win the Gold medal at this year’s Olympics, by the huge margin of 31 cm. First let’s set the scene. At the time of the Mexico Olympics in 1968, the long jump record stood at 8.35 m, or about 27 ft 5 in. In the previous eight years the record had been raised six times by an average of 4 cm, an inch or two, per time. It was behaving like most other athletic events, with regular small increases in the record. The next big target for long jumpers was considered to be 28 ft (8.53 m) but it seemed a long way off. Some considered 28 ft to be impossible, including the form jumper at the Olympics, 23-year-old New Yorker Bob Beamon. The long jump final in Mexico was on the 18th of October 1968. On his first jump, Beamon tore down the runway and leapt further than builders of the rail for the electronic measuring device had allowed. As Beamon kissed the ground and then looked up to the sky to thank God, officials had to scramble around for an old-fashioned tape measure. In the delay, a veteran sports writer announced in the Press Box, “Gentlemen, I believe we have just witnessed the first 28 foot long jump in history.” However, the electronic scoreboard eventually revealed that Beamon had in fact jumped past 29 feet: to be exact, 29 ft 2½ in (8.90 m). He had beaten the old record by 55 cm, or almost 2 feet. Lynn Davis, the Welshman who held the Olympic, European and Commonwealth records, said to prior world record holder Ralph Boston, “I can’t go on. What’s the point?” One competitor said to Beamon, “Man, you have destroyed this event.” Beamon probably didn’t hear him, because at this time he was suffering a ‘cataplectic seizure’, a paralysing physical reaction following great emotion. How great was this jump? Even allowing for the fact that it was at altitude and had the maximum allowable wind assistance, it was almost miraculous. Consider the following. Nobody broke the previous world record of 8.35 again until 1975. There was only a single jump in excess of the previous world record during the following decade. Beamon himself never again jumped in excess of 27 ft, although he did keep competing. It was another 12 years before even 28 ft was broken again. Nobody got within 30cm of the record until Carl Lewis jumped 8.62 in 1981. Beamon’s record was not broken until 1991, when Mike Powell just edged past it with a jump of 8.95 m.
Beamon’s jump is still the Olympic record, easily the oldest record in the book. The golden age of long jump was 1982 to 1995, when the best jump of the year equaled or exceeded 8.70 in 10 years out of the 14, mainly thanks to Carl Lewis. He was clearly the best long jumper of all time, and was considered by far the most likely to break Beamon’s record as he recorded a long list of jumps close to the record, but he never quite did it. These days, nobody gets anywhere near the record. There was one jump of 8.65 m in 2000, but apart from that, nobody has exceeded 8.60 m in the past 9 years (remember, Beamon jumped 8.90). The winning jumps at the past three Olympics have been 8.59, 8.55 and 8.50 m. Many of the world’s best jumpers competing in Athens, full time professionals with the best training and equipment money can buy, have life-time best jumps lower than 8.35, the record that had stood in 1968 at the time of Beamon’s incredible jump. The long jump clearly is different to other athletic disciplines. It doesn’t progress steadily onwards and upwards like other events. In the 36 years from 1968 to 2004, its world record was only broken once, while for comparison the high jump record was broken 19 times. The world record high jump from 1968 was the minimum qualifying height for the final in Athens in 2004.
Who knows when the long jump record will be broken again. It could easily be a very long time. Unless there emerges some new superstar who eclipses Carl Lewis, I could easily imagine Bob Beamon’s Olympic record lasting through the 21st century. But then, maybe there will be another freakish jump from someone unexpected. Posted on 27 September, 2004 by David Pannell. This entry was posted in Miscellaneous. I very much enjoyed the post albeit 12 years old now. I too am an Olympics tragic as well as a former long and triple jumper. The stats on performances and records are very interesting in comparison to the other track and field disciplines. Interestingly, if you look back through the long jump records at a state and Australian level you might see a similar trend – particularly in the schools records at the various state levels. It seems that a lot of records dating back to the early and mid seventies are still unbroken. Although I have not examined the data in any detail, I suspect that there may well be a positive correlation. The reason – not sure – were we simply tougher physically and mentally – did we have a diet with more fibre and less sugar – was there less performance pressure? Did we simply compete for fun and pride – there was certainly no money or endorsements at stake. Whatever the case may be – after the latest Olympics in Rio – the stats and trends you provided hold true. Thanks Simon. 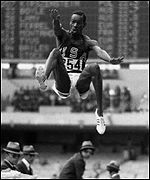 Yes, I enjoyed the long-jump competition at Rio, but it continued the trend described in my post – nobody got anywhere near the Beamon’s jump. The gold and silver medalists jumped 8.38m and 8.37m respectively, barely exceeding the world record that had stood before Beamon’s leap (8.35m).